MCTRON is a leader in the paper industry, specializing in emulsion polymers, functional barrier coatings, thickeners, cross-linkers, waterproofing resins for corrugating adhesives, and much more. MCTRON products include high-solid resins that are designed to be customer-specific as well as custom, machine-ready formulations manufactured to your exact requirements. Our PermaPel™ technology is a patent-pending acrylic polymer product line that offers unique water repellant and adhesion properties. MaxxThix® thickeners, Maxxacryl® acrylics, Maxxetate® vinyl acetate latex and MaxxaPel® water repellent size products are also core offerings. Consider MCTRON products when formulating coatings for specialty paper applications. Our wide range of Maxxacryl® acrylic and styrene acrylic latexes, MaxxLink® crosslinkers, MaxxaPel® water repellents, MaxxSperse® dispersants, MaxxVol® polyvinyl alcohols, and MaxxThix® thickeners are available. Our experienced technologies stand ready to assist in selecting the right product for your particular need. PermaPel® GA-74 is designed to incorporate our wash-durable specialty monomer technology into a typical RC (rheology controlled) polymerization system with the addition of a non-formaldehyde generating cross-linking system. The RC technology has historically been used in Floor Polishes, Graphic Arts Polymers and Overprint Varnishes. It has superior adhesion with hard to low energy substrates such as fiberglass, plastic film, foil and galvanized aluminum. MaxxCoat® WR-1008 is contiguous film of this product applied to liner board provides exceptional low 30-minute Cobb values of less than 10-g/m2 and slide angles in the mid-20’s. MaxxLink® XLB-3000 is a liquid borate based crosslinker developed for starch-based adhesives used in corrugated container board. Our commitment is to develop innovative products to satisfy the ever-growing demands of corrugated manufacturers. MCTRON’s MaxxLink® waterproofing resins have long been an industry standard for quality and performance. MaxxCoat® formulated coatings based our innovative technology. MaxxLink® XL-4000 is a general-purpose ketone formaldehyde resin that is used as a versatile waterproofing agent for starch adhesives. It exhibits excellent performance characteristics providing superior water resistance and strong bonding properties. It has shown consistent performance across a variety of substrates and formulations. MaxxLink® XL-5000 is a general-purpose ketone formaldehyde resin that is used as a versatile waterproofing agent for starch adhesives. It exhibits excellent performance characteristics providing superior water resistance and strong bonding properties. It has shown consistent performance across a variety of substrates and formulations. MaxxLink® XL 6000 is a high-solids ketone formaldehyde resin that is used as a versatile waterproofing agent for starch adhesives. It exhibits excellent performance characteristics providing superior water resistance and strong bonding properties. It has shown consistent performance across a variety of substrates and formulations. MaxxLink® XL-7200 is an ultra-high solids ketone formaldehyde resin that is used as a versatile waterproofing agent for starch adhesives. It exhibits excellent performance characteristics providing superior water resistance and strong bonding properties. It has shown consistent performance across a variety of substrates and formulations. 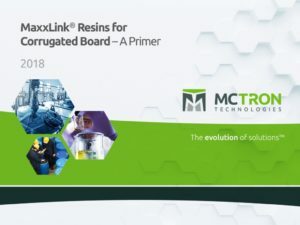 MaxxLink® XL-8020 is a thermosetting ketone aldehyde in aqueous solution, specially formulated to impart not only excellent water resistance to starch based corrugating adhesives but also maintains a superior green bond to the produced corrugated board and has a very low free-formaldehyde content. MaxxLink® XL-8045 is a is a thermosetting ketone aldehyde in aqueous solution, specially formulated to impart not only excellent water resistance to starch based corrugating adhesives but also gives very good green bond to the produced corrugated board and in addition has a very low free formaldehyde content. MaxxCoat® E-132 is a concentrated general-purpose water-based treatment for paper and corrugated board. It imparts a high level of water repellence. MaxxSurf® D70-S is a user friendly, highly effective penetrating additive that is used at low concentrations to enhance starch adhesive penetration.